At SAP Ariba Live in Amsterdam, Enterprise Times (ET) had the opportunity to talk with Shivani Govil, Vice President of AI/Cognitive Solutions at SAP Ariba. Like most out-and-out technologists she has an abounding enthusiasm for many topics. Among those discussed were AI, drones, blockchain and bottleneck analysis. None of what Shivani discussed represents any commitment by SAP Ariba to a specific plan or technology or product. Nevertheless, several possible paths forward are evident though their final manifestation (if they occur) may well be very different. AI usually means Artificial Intelligence. A more apt, in today’s environment, explanation is Augmented Intelligence. Shivani’s point here is that the objective should be to augment the user. For casual users this might mean identifying and then removing the repetitive, and releasing those people’s innate intelligence for other tasks. For expert users the intention would be to add to that person’s ability to do his or her job, by augmenting the information available. The result, if effected, would be better use of resources and skills. Augmentation, rather than artificial. Drones fascinate Shivani. 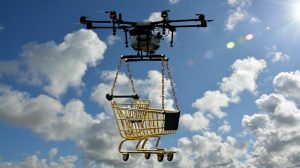 Too her they have many sorts of potential in supply chains, from completing the last mile in logistics delivery to inventory replenishment (drones scanning shelves or locations for a need before automatically initiating re-orders) to extending 3D printing services into production and delivery. One reason she thought drone adoption was slower than she expected was its specialisation. That, she thought, was changing with new companies like Kesprey. Not only does this produce industrial drones but it combines the drone with software and analytics to process what the drones ‘discover’. She felt this could be the start of broader and deeper adoption. Enterprises would have to do less integration of the drone ecosphere to obtain practical results. In March 2017 ET covered SAP Ariba and blockchain under the title: ‘SAP Ariba adopts blockchain’. Since then SAP Ariba has said little about what it is doing. When questioned Shivani reflected calm consideration combined with enthusiasm. As she put it: “blockchain means different things to different industries, different enterprises and different functions within enterprises”. To her, the most important need is to understand the economic case for each blockchain implementation. To this end SAP Ariba is working with chosen customers to pilot and try out blockchain implementations. As she summarised: blockchain implementations cannot exist in isolation: they have many participants who comprise a network; all need involvement in assessing any rationale for blockchain adoption. When asked whether this meant blockchain adoption was a long way off, whether for SAP Ariba or others, she was more bullish. Her interpretation was significant actions or deployments would not occur for 12-15 months. Then, if commercial cases exist, there would likely be an explosion of activity. After all, as she pointed out, investors have poured much money and talent into blockchains. If anything, she opined, blockchain take-up might occur faster than for other nascent technologies. She added that she thought blockchain had the potential to complement the Ariba Network, especially if it proved possible to establish an ‘abstraction layer’ to connect different blockchain implementations, whether Hyperledger, R3 or others. The point of bottleneck analysis, ET’s term, is identifying where bottlenecks exist in (say) a procurement process. To do this one must understand each part of the process. In the past that has been all but impossible. Most organisations know little about their actual processes (though, often, they think they do). With tools like Celonis, for process mining, it is now possible to document process chains based on data held in the Ariba Network or in SAP systems or both. With such data, it is possible to construct process maps or visualisations of what occurs in reality. This will represent a major step forward for many enterprises, enabling them to understand how they function. The logical extension, once equipped with maps of whole process chains, is to subject those process chains to bottleneck analysis. In most process chains there are weak points which can be strengthened. For example, some components may be available, in the procurement system, from two competing suppliers: what happens if they merge? While bottleneck analysis has clear benefits in reducing operational risk, it is not yet available (and the informed process maps are a prerequisite). When asked, Shivani confirmed that SAP Ariba did not yet offer any specific tool. For the moment it worked through partners, like Celonis, to provide the insights. Three of these four are topical. Enterprises show interest, though large scale deployment has yet to occur. The fourth, bottleneck analysis, awaits good data. There may be a similarity with IoT. Consumer IoT remains fraught. But, hidden away, IoT has major deployments in large enterprises which are generating copious amounts of data for analysis. This may be true for AI and drones, with behind the scenes (rather than secret) deployments. In contrast blockchain awaits serious action. In part this is because of its complexity; in part it is because its place remains unclear – as complement or competitor to existing systems. We live in interesting times, whether we like it or not. SAP Ariba has involvement or interest in all four of AI, drones, blockchain and bottleneck analysis.